The former Aloah Hotel, once known as the Carson House, the Hendersonville Inn, and most recently the Inn on Church, is a large, three-story, relatively severely designed brick hotel on a corner lot at 201 Third Avenue West, just west of downtown Hendersonville. The only stylistic elements are the modest Classical Revival porch and entrance. The rectangular building, with shallow T projections on the east and west sides, has a flat roof, overhanging boxed and molded eaves, and an ample one-story frame porch extending around three sides of the building. Porch entrances face Third Street and Church Street. The northernmost bay of the east side porch is enclosed as a sunroom. Six-over-six pane windows occurring singly or in pairs or triplets, generously illuminate the building. The main entrance, facing Third Avenue, is a single beveled glass door with four pane beveled sidelights. The building rests on a low stone foundation, and a low rough quarried stone retaining wall outlines the narrow grassy lawn on the two street sides. The hipped roof porch is supported by paired square posts, occurring in triplets at the corners, with a plain wooden balustrade. The hotel is remarkably unaltered on the exterior. The only obvious change is the metal awnings which shelter the south side of the porch, probably replacements for earlier canvas awnings. On the interior, the hotel is equally well-preserved. Like the exterior, the interior treatment is spare and utilitarian, with a slight Craftsman flavor to the dark stained woodwork and the fireplace in the lobby, a simple arched brick design with a heavy dark stained bracketed shelf. The lobby occupies the south half of the first floor, and this large space is supported at intervals by wooden paneled and plastered posts and exposed ceiling joists. The closed-string stair rises in two flights with a landing along the south front wall to the second floor. It has a handsome dark stained railing, with heavy square newels and simple balustrade similar to the front porch railing. A dark stained paneled registration desk, apparently original, is nestled beneath the staircase facing the entrance. French doors open from the lobby into the dining room and kitchen area, which occupy the rear half of the first floor. The dining room space has paneled wooden posts and exposed boxed ceiling joists. The entire interior retains its original doors, with five horizontal panels, dark stained woodwork, and wooden floors and plaster walls. Each of the guest rooms bas a louvered door in addition to the solid paneled door. 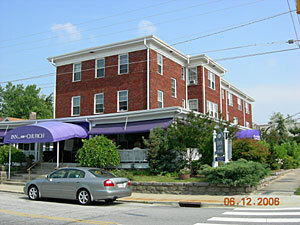 The Aloah Hotel is one of the few hotels in Hendersonville still operated as a hotel. Known later as the Carson House and since the early 1930s as the Hendersonville Inn, the Aloah is one of the last of the town's hotels, and its plain sturdy brick design and ample wrapround porch reflect comfort and continuity. It is representative of the Inns, Boarding Houses, and Hotels property type. Originally, this section of Hendersonville was filled with other hotels catering to the tourism boom: most notably the Hodgewell Hotel, which was at the corner of 4th Avenue West and Church Street, a block north of the Aloah Hotel; and the Kentucky Home at the northeast corner of Washington and 4th Streets, a block northeast of the Aloah Hotel. Both of these structures have been demolished. Aside from its historical associations, the Aloah Hotel is also notable for its continuous use as a hotel. The 90' x 150' rectangular lot on which the Aloah Hotel sits was originally owned by Dr. Columbus Few, who sold the property for $1,500.00 to his son C. Few, Jr. in 1914 (Henderson County Deed Book 84, p. 257). The deed mentions the lot only with no mention of improvements. Few, Jr. sold the property to J. O. Bell in 1910 for $10,000.00 with a bank note of $1,800.00, indicating the balance due. It appears that J. O. Bell was the builder of the Aloah and sold the property in 1921 to Mrs. Etta Carson. The building’s name was changed to the Carson Hotel or Carson House. Apparently, Mrs. Carson lost the hotel during the Depression, because it was sold on the Courthouse steps at auction in 1932. At this time, Mr. W. H. Britt bought it for $25.00 from the Green River Manufacturing Company (Henderson County Deed Book 203, p. 134). Once again, it experienced a change of identity, becoming the Hendersonville Inn. In 1943, the hotel was sold to Ira E. Johnson (Henderson County Deed Book 249, p. 305). Finally, in 1985, I. E. Johnson deeded the property to his son, E. Leland Johnson. It was known as the Inn on Church for a number of years, until current owners Michael and Jeanne Gilligan renamed it The Henderson.